One of our favorite types of museums is the outdoor museum concentrating on life as it was lived in former times. In Bishop, California, there is the Laws Railroad Museum and Historical Village. In Dearborn, Michigan, there is the Henry Ford Museum and Greenfield Village, which I saw as a kid with my parents. And it’s not just an American phenomenon: Martine and I loved Enkhuizen in the Netherlands, and in Iceland I enjoyed visiting Reykjavík’s Arbær Open Air Museum. 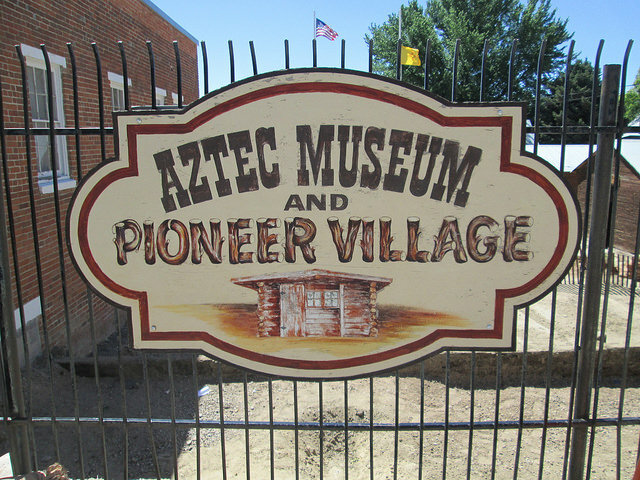 Finally, last month, Martine and I spent an enjoyable afternoon touring the Aztec Museum and Pioneer Village in Aztec, New Mexico. After visiting the Anasazi ruins at Aztec Ruins National Monument, we drove down the street and checked out the Aztec Museum. The more we looked, the more we were drawn into the vortex of pioneer life in northwestern New Mexico. There were toys, costumes, minerals, three barber chairs, agricultural implements, and, in the back, a whole pioneer village consisting of small-sized schools, stores, doctor’s office, pharmacy, blacksmith—you name it. One of the strangest exhibits was the Pecos West Cyclorama, a labor of love by Valenty Zaharek which “features over 100 hand carved woodcarvings of people, animals, plants, buildings, vehicles and the high mesas and mountains of the desert Southwest. The cyclorama measures eighteen feet in diameter and slowly rotates as old west cowboy music plays in the background.” I spent over half an hour admiring the attempt to summarize the Old West in a rotating wooden display, with music no less. Martine and I also went into the Pioneer Village outbuiildings, which are built to approximately half scale. 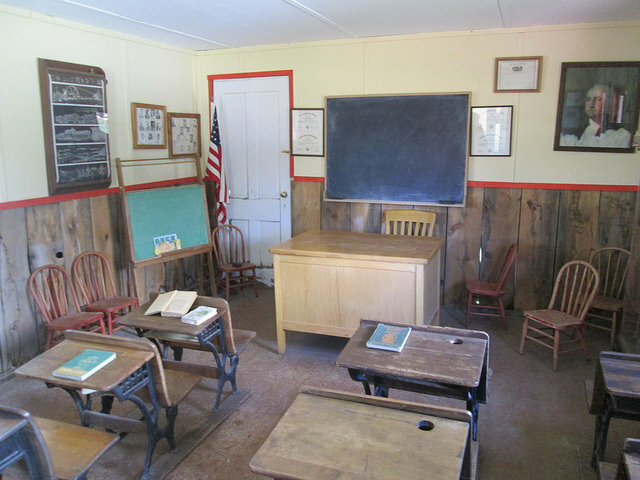 Above is a photo of the little one-room schoolhouse, complete with teacher’s and students’ desks, blackboard, and typical textbooks and wall displays. The same attention to detail appears in all the other buildings as well. Originally we didn’t plan on coming to Aztec. Instead, we were going to go on to Durango, Colorado. When we were in Chama taking the Cumbres & Toltec Narrow Gauge Railroad, however, Martine was showing signs of discomfort from the altitude, so we changed our plans and went to Aztec instead. We had no reason to regret our decision.